I carried a Sig P229 .40cal for my duty weapon for years. 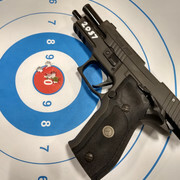 Great pistol! Good to hear from you and hope to see you in COD soon. Some of us fly it regularly on Tuesday and Thursday afternoons at 1:00 Pacific. Please come join us and we can get you up to speed. Send me an email to jp.herring@comcast.net so we can discuss how to help you get everything back up to speed. Blazin, it's been a while. I hope to see you in the skies soon. Heck, I hope I get more time to fly myself. See how it goes, which is more popular? BOS or IL2? I'm guessing BOS due to more interesting landscape on eastern front? Which I totally get, I just happened to have IL2 purchased a while back, I bought BOS as well but can't remember what I did with it so I'll have to buy it again. You won't need to buy it again. Just go to the website, www.il2sturmovik.com and log in. they'll have a record of the purchase there. You can just redownload it. Try flying on the TWC Mission server. It's usually pretty busy with AI, if not human pilots. We'll be flying there on Tuesdays and Thursdays at 1:00 Pacific time. Look for us on TeamSpeak.